Bed And Breakfast240 sq. ft. 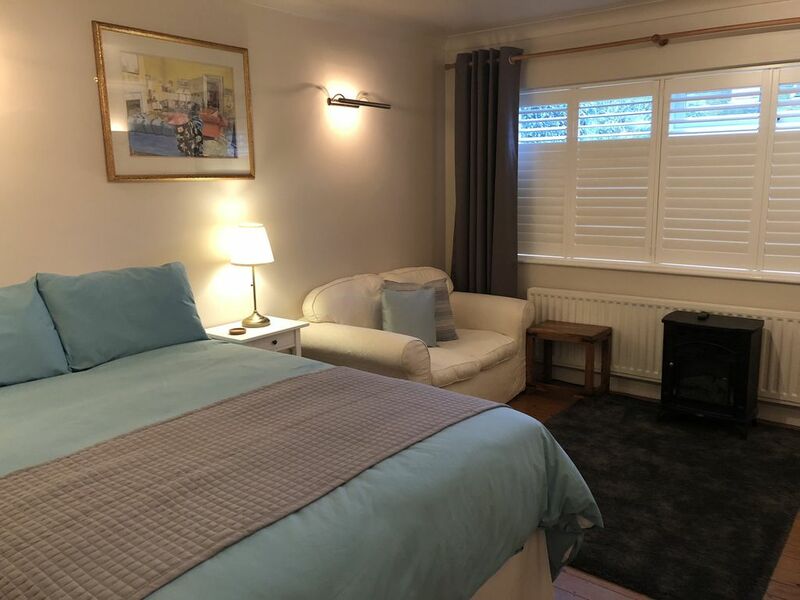 This cosy ground floor self-contained room is in a premier location within a short walk of Lymington town centre with its excellent shops, cafés and restaurants and ancient Saturday market . Studio 24 has it’s own front entrance, compact shower room/toilet (unsuitable for the less able) and parking space; provided for your stay is freshly laundered linen and towels. Coffee / tea making facilities and supplies are included, along with supplies for continental style breakfast. There is a courtyard type area available for use by guests, which benefits from afternoon sun. Great studio accomodation a short walk from the centre of Lymington..
We have just returned from this great studio accommodation. The studio is about a 15 minute walk to the centre of Lymington and 5 minutes to Waitrose. The room was spacious with bed, sofa, small dining table, hanging and storage space for clothes, well-stocked crockery cupboard, TV and fridge. The shower room, as it says in the description, is 'compact'. This was fine for us, but it may not suit larger or less mobile guests. The host Jayne was lovely and everything was spotlessly clean. The continental breakfast, provided was good and the on site parking is also a bonus. We had some great meals out in Lymington and we would recommend The Monkey House, The Lanes and The Ship Inn. Was made very welcome on our arrival. Room was absolutely beautiful. Would definitely recommend and hope to visit the area again in the future. Thank you for your comments; we would love to welcome you here again. We are very sorry to hear that our accommodation was not suitable for your needs. Thank you for your comments about the shower; there is an isolation switch, which we will make more obvious. Lymington is small old town with shops & places to eat convenient to explore surrounding area & for ferry to isle of wight. Accommodation was cosy & clean suitable for a couple looking for somewhere for a short stay, parking was good & the owners were pleasant there if you needed them, not in way if you don't, continental breakfast was adequate for our needs as we prefer to go out early & eat later. we were meeting up with family who had booked house other end of high street so was perfect to meet up as we were only short walk from town. Would stay again if we returned to Lymington. Thank you for your kind comments; we're glad you enjoyed your stay. We are both very impressed with this accommodation, and were given a really warm welcome by Jayne. Location was ideal for the New Forest and surrounding area. Facilities were spot on, value for money excellent, and we would definitely be back again soon! Thank you for your comments; we would be delighted to have you stay again. Very clean, lovely breakfast and room, and great having your own entrance to the room. Although located on a main road we didn't notice the noise of the traffic. Excellent value. Thank you, we’re glad you enjoyed your stay. We look forward to welcoming you again. Lymington has many welcoming pubs, wine bars, restaurants (including Italian, Indian and Thai cuisine), tea rooms, traditional independent shops, well known chains (including Waitrose and Marks and Spencer) and also several beauty salons for that little bit of holiday pampering ! Lymington Charter Market (established in the 1250s) takes place along the length of the High Street every Saturday throughout the year from 8am to 4pm. It's by far the largest street market in the New Forest area and with a great deal of history behind it, is nowadays a special experience for New Forest visitors to enjoy. The St Barbe museum is a must and from May – October regular “Story of Lymington” walks are escorted by volunteer guides in the town. The popular Community Centre offers a wide range of live performances, films and activities. A great venue for both locals and visitors alike. Throughout the year, various activities take place in the town, including an Italian festival, a French festival, a music festival and of course a late night shopping event before Xmas. The Sea wall offers many interesting walks, - as far as Bournemouth and beyond to the west! Walk the shingle bank from Keyhaven to Hurst Castle (built by Henry VIII to defend the Solent and where Charles l was imprisoned before his trial & execution in London in 1649) - or take the ferry! Fossil hunting, paddle boarding and surfing are also popular activities along this interesting coastline. Regular ferries from Lymington will take you across to the Isle of Wight. If you want to explore further, there are many nearby interesting places such as Highcliffe Castle, the lovely village of Beaulieu with its well known motor museum and riverside walk to Buckler’s Hard and the maritime museum - all within easy reach. Bird Watching – The area is a wildlife haven and very popular with bird enthusiasts. The sea wall is a favourite place to see swans, Brent geese, oyster catchers, little egrets and curlew. There are hides located in Keyhaven and Lymington. During the summer months you can take the Hop-on, hop-off New Forest bus tour from the High Street – a great ‘car free’ way to experience a wide area of the New Forest National Park. A short drive to the village of Hythe gives you the opportunity to take a ride on the World’s oldest pier train to the end of the 130 year old pier, from here you can catch the regular ferry to Southampton. Here you will find the Tudor House, Art Gallery and the Sea City Museum with its unique exhibition and interactive story of the Titanic. The New Forest – ponies can be found grazing on the open heathland and you usually get to spot a deer or two as well. Cosy and traditional forest pubs are a welcome stop after exploring the many beauty spots in the forest and varied walks; autumn is a great time of the year to capture all the wonderful changing colours and fungi of the forest with your camera. In winter, Bournemouth and Winchester host their special Christmas Markets (Winchester also having its seasonal outdoor ice rink from November). Lymington celebrates the run up to Christmas in true festive spirit having late night shopping with complimentary mince pies and sherry, carols and Father Christmas.